Today we visited the past, a past that started before I came into the world, but ended in my lifetime. I’ve always heard about the cold war, but never fully understood the complexities of it. 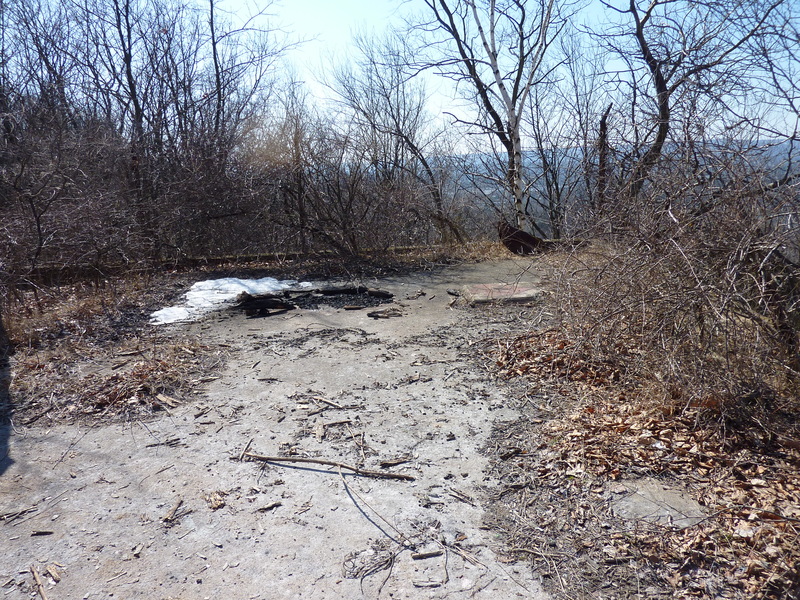 We hiked up to the abandoned and obliterated Nike Missile Base in Plainville on the Metacomet Trail. 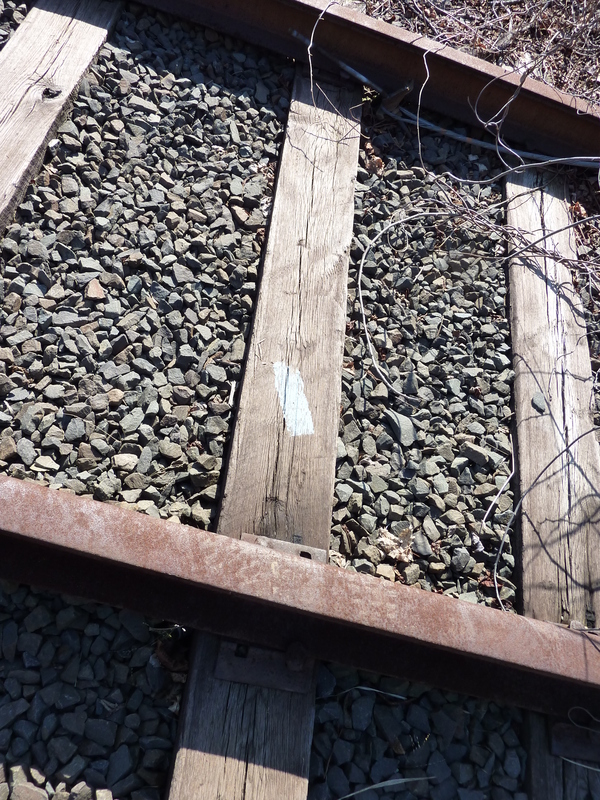 The hike starts right off of Route 372 in Plainville, crossing the rail line. We decided this hike would be more of a workout, than a meandering hike in the woods. The forest is just beginning to shake off the effects of winter, the predominant color of the forest being brown. After quick ups and downs, we reached the ridge where our view included sights of the highway, a shopping plaza and houses to one side and deep woods to the other side with amazing rocks randomly strewn about. We reached the Nike Missile Base. It was in operation from 1956 -1961 in Plainville. The majority of the compound is behind a fence and we didn’t venture into this area. The only remnant we could visibly see was a launch pad and the local hangout for party people. I can’t imagine living around this area in the late fifties and seeing missiles up here. Ready to defend our country in a moment’s notice. This was only 1.6 miles from where we started, so we decided to go another .2 miles over to Pinnacle Rock. 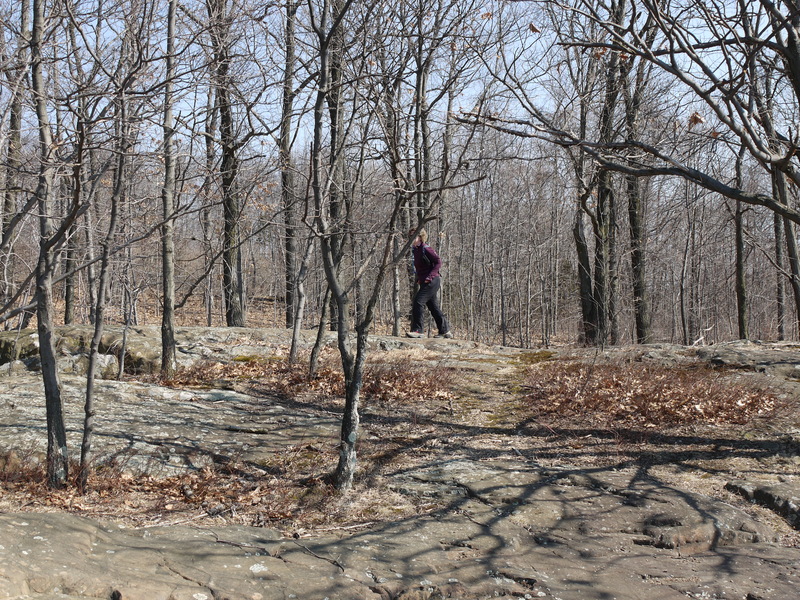 We had been to Pinnacle Rock, starting from Route 6 in the fall. As we neared Pinnacle Rock, we could hear lots of voices and some cheering going on. On a few of our hikes, we have had the pleasure of heads popping up from below us. 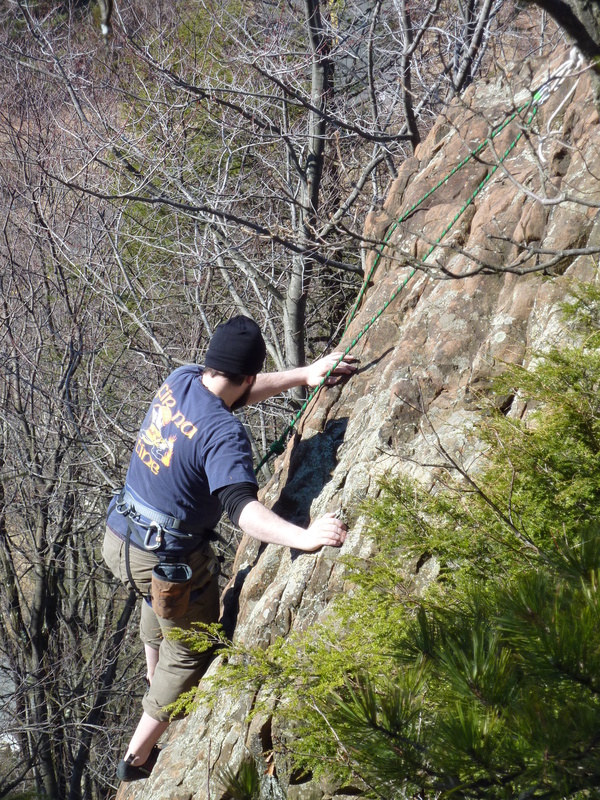 Today was no exception, we had rock climbers, scaling the face of Pinnacle Rock. We met the group coming up, including three small children. One who actually climbed up on his own. They called our cell to leave their email address, so I could send them the photos I snapped. The only problem…our phone never received their call, so I have no address for them. 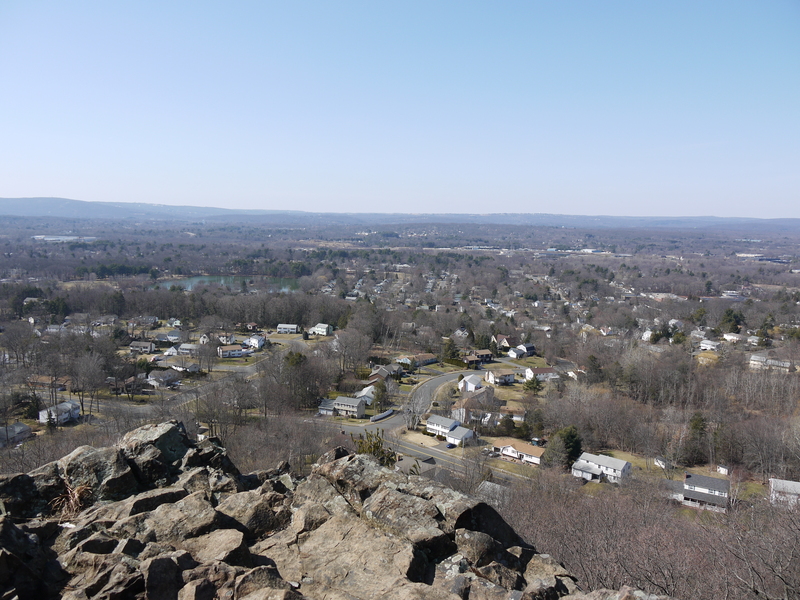 If anyone knows of people rock climbing Pinnacle Rock on March 7, send them to my blog, please. We walked all over the head of this massive rock, deciding on pictures to take, soaking up the warmth of the sun and listening to the horrifying sound of an atv. We decided it was time to head back the way we came. We power hiked back to our car, wondering what it must have been like to be down on the road, looking up and seeing missiles positioned to fly into the air and defend our country in the middle era of the cold war. We declared this to be one of our repeat hikes, a hike that we will likely re hike again, just like Ragged Mountain and Chauncey’s Peak. The terrain was hilly, providing for a strong cardio workout, safe to do quickly, and gave us great views. 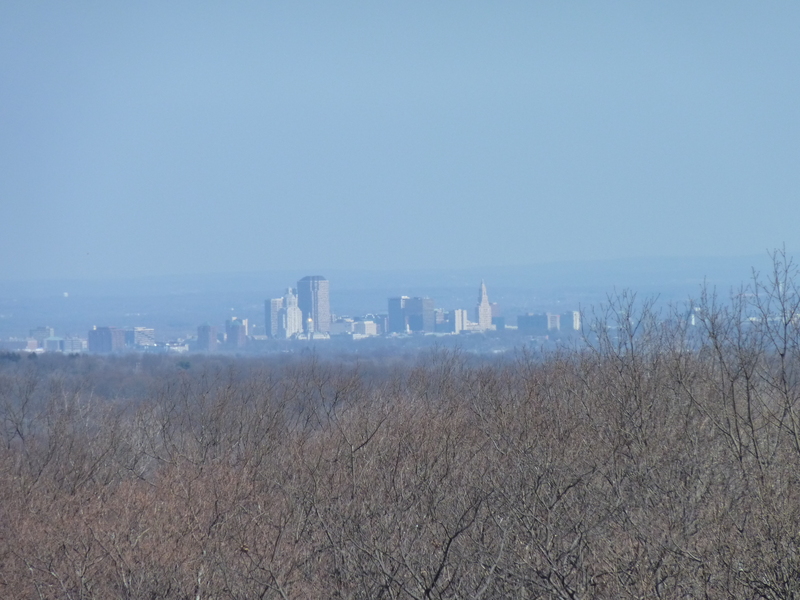 The Details: Metacomet Trail from Route 372 in Plainville. 1.8 miles up to Pinnacle Rock. We did 3.8 miles with some wandering around, two hours. Easy hike if fit and you enjoy going up and down quickly. We did this without trekking poles. I grew up in Pinnacle Heights housing projects on the New Britain side of the NIKE Base. We hiked up over Pinnacle mountain often. At the top where the concrete slab we saw huge guns with missles at the ready, surrounded by an electrified fence. The military stationed there would warn us away, but we were kids, so if we persisted they actually would turn the current off the fence so we could cling onto it with our hands while we side-shuffled our feet along the little concrete ledge outside the fence, so we could continue down the Plainville side of the mountain. I remember it was too steep, and we were thankful for the flat ledge over the peak. We would then go down to Tony’s Fruit Stand located on old Rt 72..past the old A&P. One time we even carried a friends old basset hound “Spot” by tying him in a shirt around his body as we scaled, clinging to the fence, past the NIKE base. p.s. The reason that base was located in New Britain was because it was known all over the world as the “Hardware Capitol of the World” because it manufactured so much by way of supplies to fight WWll. They were afraid it would be the first place bombed if the Cold War ever turned HOT. I can remember all the Duck & Cover drills in school. Slater Road School even had a Bomb Shelter in the basement. They offered weekend drills for people to spend locked inside, eating dried rations, and using 55 gallon drums as latrines. Nobody ever took them up on those offers twice…lol.